For many Rice students, voting Donald Trump for the presidency is out of the question, but Hillary Clinton may not be the clear alternative. The Thresher applauds the Marching Owl Band’s performance during the halftime show of the Rice University vs. While the Student Association’s decision to create the appointed position of deputy treasurer and deputy parliamentarian (see p.
In the coming weeks, Rice University Housing and Dining will be introducing a Saturday night dinner option for students who wish to dine on campus (see p.
Brown and Martel Colleges’ recent initiative to provide active shooter training their for cabinet and college members should serve as a model for the rest of the Rice community. When the Survey of Unwanted Sexual Ex-periences proved that, much like other college campuses, sexual misconduct and assault are prevalent at Rice, many in the student body rallied around the cause and proposed change in the form of a mandatory Critical Thinking in Sexuality Class for new students. In an email sent to the student body to clarify concerns surrounding the credit hour cap proposal recently passed by the Faculty Senate, Provost Marie Lynn Miranda and President David Leebron referenced the Thresher when describing past student input. Amid a flurry of RSVPs, the Student Association claimed on their Facebook event for the CUC protest that the Faculty Senate will “likely approve” the widely contested credit hour limit proposal (p.
As prospective students visit for Owl Days to decide whether to begin their career at Rice, those who might consider pursuing mechanical engineering may question their decision if they hear of the department’s recent town hall. A recent decision by the Blanket Tax Committee to recommend an organization for subsidiary status is at risk of being overturned (see p.
Beer Bike is one of the most anticipated days of the year, with Rice students across campus participating in Beer Bike festivities. Rice students often joke about how they seem to be taking more classes than their friends at similar universities; it turns out that for many, this observation is actually true. All three Student Association external vice president candidates brought big ideas to the table during Friday’s debates. This year’s Student Association presidential race has been a competitive one. Lovett College junior Griffin Thomas has leveraged his experience as Lovett president to position himself as an outsider willing to be a strong figurehead for student opinion. As the Student Association Senate votes on Rice Video Productions’ blanket tax status today, the Thresher urges its members to send the measure to the general election ballot. Sid Richardson College is embroiled in controversy after a female undergraduate reported that she was sexually assaulted by a male undergraduate at a private party on the college’s seventh floor. The Rice University Police Department sent an email Saturday announcing an investigation into the assault that allegedly occurred at 12:30 a.m. the same day before announcing later that night that they had identified the suspect. Due to a new Texas state law, Rice University Police Department will now be subject to open records requests (see p.
For a student body that is often self-described as uninformed and apathetic, Rice has proven in recent weeks just how powerful and outspoken our voices can be. In light of the conversations taking place all over campus on Senate Bill #4, which would create a task force to develop a course for new students on critical thinking in sexuality, we call upon more students to join the conversation on these pages. If you feel your voice is not being heard, reach out to us and use the Thresher as a platform to challenge the status quo. Recently, at Wesleyan University, students voted to cut the newspaper’s budget due in part to the publishing of an op-ed critiquing the Black Lives Matter movement, while at Yale University, hundreds of students protested following a master’s email questioning sensitivity in regards to Halloween costumes. Both events reflect the precarious balance on college campuses between promoting free speech, challenging traditional thought and maintaining empathy towards peers. The incidents at Wesleyan especially exemplify the importance of an undergraduate paper that stimulates ongoing conversation on sensitive topics and of students being able to critically differentiate between news and opinion. The Thresher believes it is your responsibility to challenge your peers’ ideas, and it is our responsibility to provide you a platform to do so. In line with this belief, although we reserve the right to withhold submissions, we choose to publish any opinion piece that is sent to us. It is not our place to determine the validity of an individual’s opinion. Rather, students must understand the corresponding news behind an opinion piece, and formulate their own opinion after fully examining the nuances and perspectives of the story. Students who remain largely uninformed by choosing to use opinion pieces as their sole source of information do a disservice not only to themselves but to their entire community, especially if they go on to propagate these opinions as fact. That being said, while we do try our best to report unbiased, comprehensive news, we are not infallible. It is easy to miss the quieter voices of a news story and even easier to entirely neglect those that are silent. We work hard to prevent our personal opinions from influencing the news we report, but the topics and perspectives we cover are undoubtedly shaped by the networks and connections we hold. We cannot emphasize enough the importance of you reaching out to us if you feel we are neglecting to include your voice or provide coverage of news that matters to you. This campus is more than capable of being informed, critically examining issues and engaging in debate, but we cannot allow the conversation to begin and end with SB#4. Together, the Thresher and the student body can ensure that pertinent issues garner the coverage and conversation they deserve. 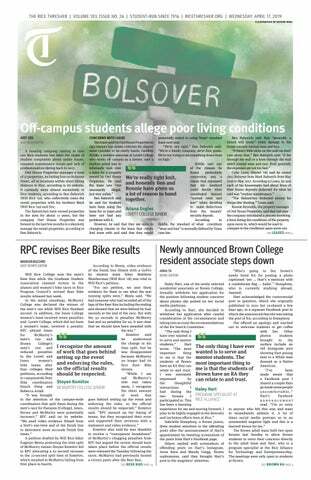 Unsigned editorials represent the majority opinion of the Thresher editorial staff. All other opinion pieces represent solely the opinion of the piece’s author.